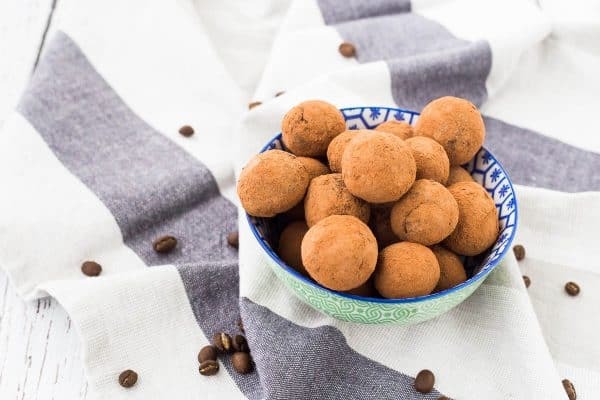 These chocolate protein balls will satisfy your chocolate cravings without a sugar crash later and will give you energy to get through your afternoon! Are energy balls so 2016? Well, even if they are so last year, I don’t care. I’m always behind all the hottest trends, so if I’m behind on this one too, it would make sense. Remember 3/4-length sleeves? I resisted that trend until they were practically out of style, and then my closet was stocked with them. Same with skinny jeans and pretty much everything else. It’s cool, I fully embrace my dorkdom. 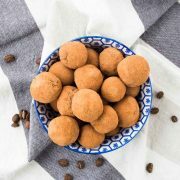 My obsession started when I developed a recipe for nut-free energy balls after finding a total lack of nut-free options online. My kids loved them, Ben loved them, and I loved them. They were the perfect solution to my afternoon chocolate craving and I felt great about feeding them to my kids too. Next up was a non-chocolate version, and the apple cinnamon no-bake energy bites were just as popular. 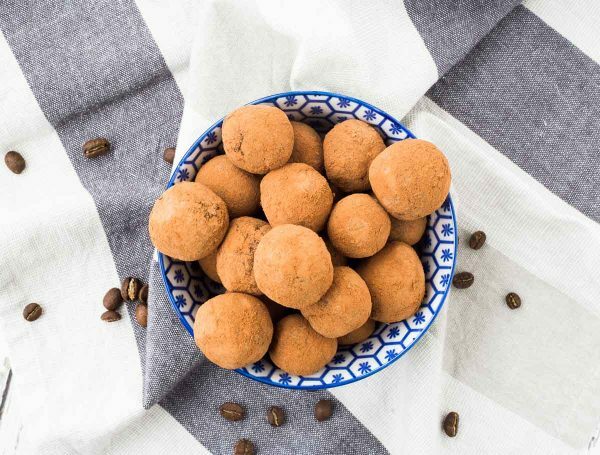 These chocolate protein balls have an extra little boost to help you through that afternoon slump — espresso powder (this is my favorite kind). 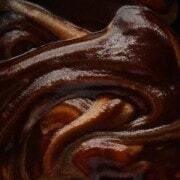 It not only gives you a little boost of caffeine, but it also adds depth to the flavor of the chocolate. I used chocolate shakeology for this recipe because a) it’s what I had and b) I love the strong chocolate flavor it has. PS: I’m technically a Beachbody coach and I don’t like to admit it, but I’m required to disclose that. Our little secret? I do love the Shakeology and the workouts. But yeah, let’s keep it between you and me and the rest of the internet, k? Thanks!!!! PS: I used to buy pitted dates for protein balls but then a pit snuck through and made it into my food processor and it was super annoying. And loud. And I had to throw it all out. So now I buy the kind with the pits in them and pit them myself. If you want it done right, gotta do it yourself I guess! PPS: I use this scoop — I also use it for cookies! 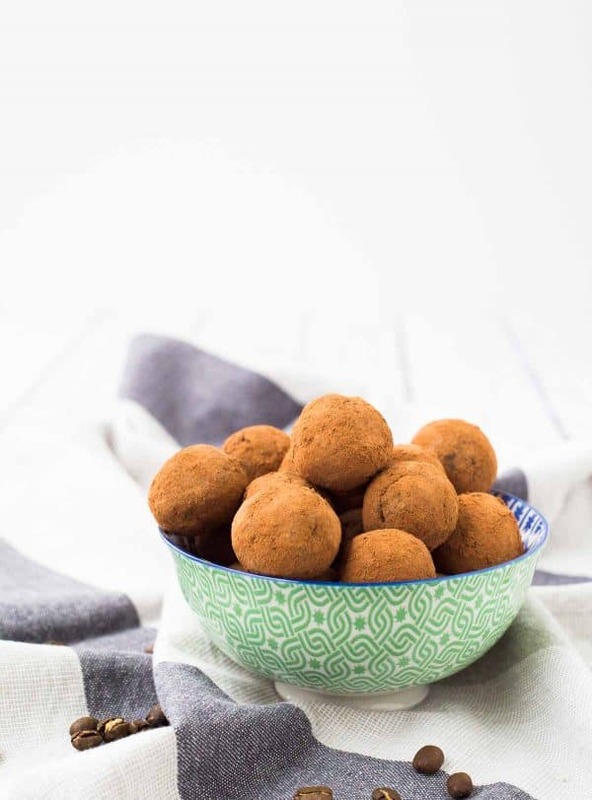 Roll into balls (I used a two teaspoon scoop) and then roll in additional cocoa powder or flaxseed meal (I typically use a combination of cocoa powder and flaxseed meal). 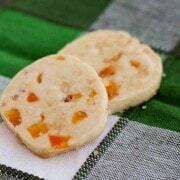 Note: Best stored in fridge and eaten cold. 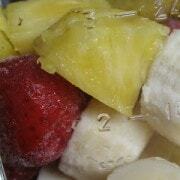 Note: Mixture will look very dry at first, just keep processing it and it will come together. Verdict: I love snacking on these! Husband’s take: He said these were his favorite flavor yet! Great!! Thanks for responding. I am going to try it today, I’ll let you know how it goes!! 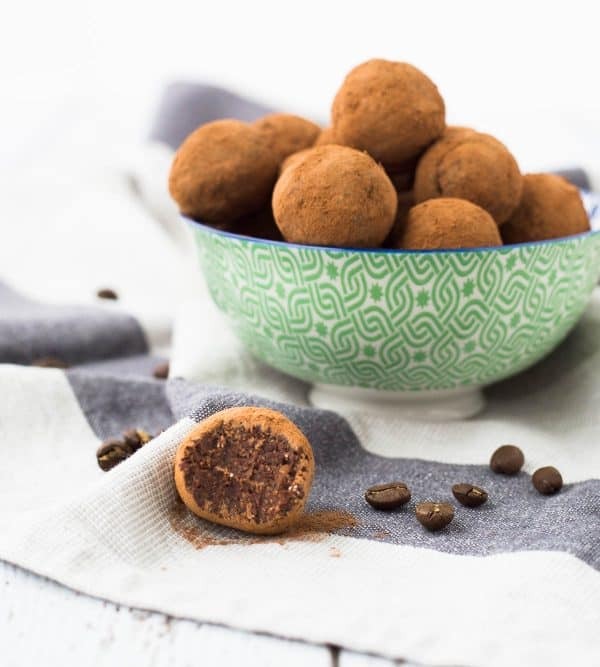 Can I use Cacao powder instead of unsweetened Cocoa powder, or will the flavor be too strong? Thanks! I feel like energy balls won’t ever really go out of style!! I am always on board with a healthy and delicious food that will power me through a rough workday!